The Pure Contour 200i Air is the follow up to the popular Pure Contour 100di, except this time the company has decided to ditch the digital radio features altogether – meaning this is a simplified AirPlay speaker in all but name. 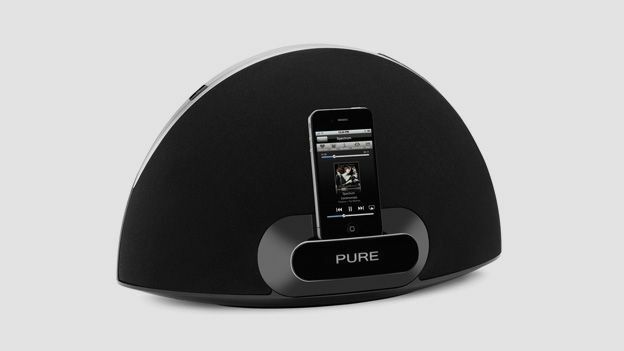 It also means that Pure is stepping outside of its traditional territory as one of the key players in digital and internet radio in Blightly, to take on the likes of Logitech, Bowers & Wilkins and Philips in the iDevice docking arena. The ace up the 200i's sleeve however, is its price. While it can't compete in terms of performance with the likes of Libratone Lounge or the B&W Zeppelin Air, it doesn't really have to – coming it at almost half the price. With an RRP that's a penny shy of £200, it's hardly a budget dock but, in terms of features and performance, the Pure Contour 200i Air is a much more attractive option than the likes of the Philips DS8800W or the Logitech UE Air – two systems with similar setups and much costlier price-tags. Looking a lot like its predecessors, the Pure Contour 200i Air is a slick looking machine with a reassuringly solid build quality. In design terms, there's not really much to it – it's a half-dome shaped speaker packing a soft grille on the front, hiding the dual speaker drive units, and a soft rubberised backing that packs a panel full of ports; DC in, digital coaxial, aux-in, Ethernet and a Wi-Fi set up button. These two halves are split by a silver, aluminium like gutter that houses the four physical buttons built-in. Those being, a power switch, a mute button and volume up and down buttons. The soft speaker grille also hides a multi-coloured LED indicator. There's no LCD panel, as per the original Contour and the Contour 100di, which is a shame but it's not really necessary. And that's because Pure has stripped back the features with the 200i. Gone are the DAB, FM and internet radio options, and in their place comes Apple's AirPlay system. The idea being that anything you want to play, whether it be radio stations, podcasts, music, audio books and so on, can be done straight through your Mac, PC, iPhone, iPod touch or iPad. It's simple enough to set up the AirPlay connection. If you're using an iThing – simply dock it when it's connected to your home Wi-Fi and away you go, or use the simple wireless, or wired (using the Ethernet) configuration methods to get your 200i included in your router's Wi-Fi club. Pure hopes, obviously, that you'll use its Pure Music / Lounge ecosystem which brings together streaming music, internet radio and more into one tight little package. For £4.99 a month Pure Music will let you stream music from a range of devices. It differs from Spotify with its tagging service, first introduced with FlowSongs, that lets you tag a tune that you like when listening to the radio (on any of your Pure web-connected devices or apps) and then purchase the song, explore the artist or stream more of their music. Pure Music and the Lounge are great but, this is an AirPlay device don't forget, so you can chuck anything you like at it from your iDevice and it'll play back the audio – whether that be Pure's app or indeed from any other popular platforms such as iTunes, Spotify, Last.fm and so on. Sound quality on the Pure Contour 200i Air is great, and more than we would expect for a sub-£200 setup. It's not really loud, or deep, enough to replace a dedicated multi-speaker Hi-Fi setup (although using multiple Contours is possible using iTunes) but it's a fantastic standalone speaker. It boasts 36W RMS of detailed audio with twin bass ports although we found that we had to fiddle around with the EQ settings on our iPad before we hit optimum sound. We tested the Contour using AirPlay almost exclusively although you can dock an iPad, iPhone or iPod and you'll get the same sound quality – while at the same time giving your Apple toy a battery boost. You can also plug in a non-Apple device using the aux-in port, or hook the 200i up to another sound system using the digital coaxial option. The Pure Contour 200i Air is a great AirPlay enabled docking system that is light on features, but heavy on performance. Pound-for-pound performance that is as, at less than £200, the 200i has a sound quality that far exceeds its modest price-tag. We wouldn't exactly call the sound 'room-filling' but if you are looking for a great mid-level docking solution packing AirPlay, perhaps for a games room, office or bedroom, the Contour 200i Air could be just what you need. What it does lack is extras – a built-in DAB radio would have been nice, as would an LCD display, or maybe some EQ controls. But, if Pure had to decide between extras and quality, to keep the sub-£200 RRP then we think it made the right decision.